I am again another year going to so miss the traditional OPI Holiday collection. Seems as if they think it's either not politically correct to have a holiday inspired collection of shades - or their marketing tells them the movie tie ins bring in more $. I am older - was in college when the Muppets started on PBS. I am not a fan of seeing 6 more difficult to get off glitters in this collection. I have enough glitters to last me a lifetime....plus I tire of them in 1 day and want them off. I definitely need the glitters. 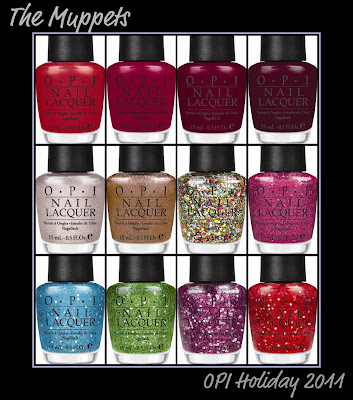 I love that OPI is putting out more and more glitter polishes in their collections. And they aren't just regular old glitters, they're really unique. I love them so much I bought the entire Burlesque collection last year. These look so pretty! Can't wait for the release! Rainbow Connection looks awesome! I can't wait to see the swatch. Looking forward to this collection. Love the look of the glitters. I have set aside a budget just for the whole collection. Being a nail polish collecter and a lover of all things Muppets...this is just the best of both worlds. So excited about this collection!! !